In case you live in the Seattle area, or are heading there soon for a family vacay, you should consider a day trip to Whidbey Island. It is a wonderful place to spend time as a family and very picturesque--your kids will go wild when you drive your car onto a large ferry :) If you enjoy antiquing, you'll be interested in knowing we passed a few thrift and antique stores that begged to be searched. It was almost painful to not stop! When it comes to eating lunch or dinner, make sure you eat at one of the delicious eateries in Coupeville (we hit the deli and were not disappointed by the homemade shakes or pulled pork sandwich). Within just a quarter mile you'll find 5 restaurants that all boast excellent reviews. 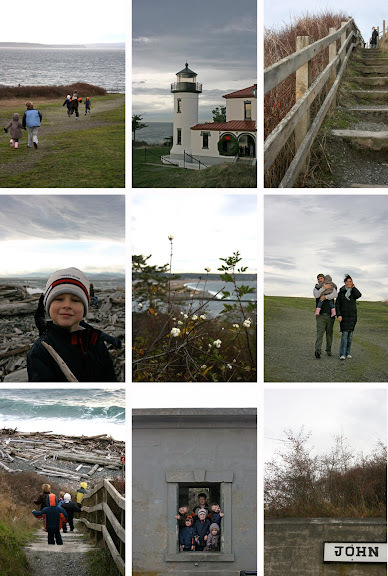 And last, hit Fort Casey with the kiddos. They'll have the chance to play hide n' seek in old WWII bunkers, explore a lighthouse and throw sticks and rocks into the ocean. For my kids this equaled heaven. The views are amazing as well so go, go, go! Hey! Hope you're doing well. That deli was amazing and is definitely our new stop in Coupeville. That was such a fun day trip...next time we must do it in the summer!!! I have never visited Seattle but these pictures are so tempting! I love Whidbey Island! I went there with my two best friends in junior high. Absolutely gorgeous place. I love your pictures. I grew up in Everett so I have been to Whidbey Island many, many times. You make me reminisce. We used to go pick wild blackberries that grew on the side of the road and then we would buy vanilla ice cream from the Dairy Queen and make a fresh blackberry shake. Yum. Did you get to visit Deception Pass? Now THAT is a beautiful view! thanks! i live in seattle (only since june) and we've taken ferries here and there, but not yet to whidbey. thanks for the suggestion. it's also always nice to have an eating recc. Did you stop in Port Townsend? Quick ferry ride from Keystone and we've got quite the cute little town! I'm from Seattle and love, love, love Whidbey Island. How did you discover it? Do you have friends or family out here? Thanks for blogging about it, Seattle often just gets pegged as the rainy city when there are such delightful little gems around here like W.I. Cheers! My Aunt lives in Port Townsend. That whole area of WA is always fun to visit. We plan to visit in late summer this year (maybe catch the wooden boat festival?). My hometown! Did you walk thru downtown Langley?Lots of cute little shops and eateries. (sigh) I haven't been back in ages! So fun to see pics of places I recognize. Glad you had fun there! Well, came upon this post much later in the year, but just wanted to add my two cents. We LOVE Whidbey Island as well and spent our courting and honeymoon years wandering the shoreline. It is a very special place to us. Deception Pass is a must for the beaches, little trails, huge log teater-totter, and amazing views. When the weather is nice you can rent a canoe to paddle around Raspberry Lake-that is really fun. Also, my husband surfs and always stopped at Fort Ebey when he needed a surfing fix (yes, good surfing, but very cold water) and that is a pretty beach area as well. And a ferry ride to Port Townsend is a must as well. Just go on as pedestrians since the town is so walkable and the ferry dock is right there on the main street. Much cheaper that way. The cutest quaint little town you've ever seen. Love all of your pics.